I’m sure that by now you’ve read enough to realize that cosmetic surgery is scarier than you originally thought. The projection of success stories usually covers up the number of botched jobs, keeping them out of the spotlight. Which happens to be a big problem, because we need to make informed decisions about our health and our bodies. Despite claims by medical professionals, you are putting foreign liquids in your body, sucking parts of yourself into plastic containers, and pulling your skin every which way. The industry would have you think otherwise, presenting you with photographs of beautiful, toned young women. But reality doesn’t cease to exist just because it’s hidden behind a clean cut website. There are plenty of individuals who have gone too far where injections are concerned. That’s easy to see among celebrities like Pete Burns, Jocelyn Wildenstein, Michael Jackson, and Donatella Versace. But what about the truly botched jobs? The procedures that went terribly, terribly wrong? They’re out there…if you look for them. Just Googling plastic surgery will give you top destinations and doctors, and looking up disasters will likely give you pictures of celebrities who got a little too excited. But digging deeper is what offers a truly honest look into the reality of what happens when you mess with your body. Example number one: Hang Mioku. You’ve likely heard her story, though the publicity died down long ago. She was a beautiful South Korean model who became addicted to silicone injections, desiring smooth skin. She began injections at age 28 and doctors refused to continue surgery after her face became noticeably enlarged. Obsessed, she obtained black market silicone and injected it herself. But what really tipped the scales wasn’t the illegal silicone – it was the cooking oil she used when her black market stash ran dry. Now, ten operations later, she is still scarred and barely recognizable from her former self. Yet another sad example of the Hollywood influence. But one of the biggest things you can take away from Tara’s case is to go to a reputable surgeon and pay what it’s worth. Tara reputably went to a discount surgeon and paid for her breast implants with a coupon. 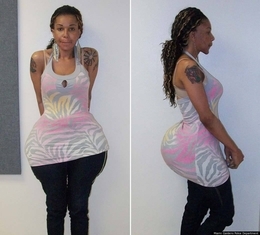 Her surgeon was not board certified to perform her liposuction. In fact, here in the US, a plastic surgeon does not have to be certified to perform liposuction – if you’re a dermatologist, you’re authorized. The after pictures showed that her breasts were completely different sizes and that her stomach was rippled and uneven. She eventually underwent reconstructive surgery, which was performed by Dr. Steve Svehlak, one of the top plastic surgeons in the nation. Botched celebrity jobs are certainly better known, but the everyday botched jobs can be much more horrifying. And what’s worse is that most everyday folk don’t have the luxury of paying for reconstruction. Heard of Oneal Morris? She goes by ‘The Duchess’ and performed cosmetic surgery without a license until her arrest a few years back. Dozens of women have come forward with sometimes life threatening injuries due to her malpractice, and they’re bound to make you cringe. One patient claimed that Morris used tire sealant in her gluteal injections. Another victim, Shaquanda Brown, went into Morris’s home for a procedure and saw super glue and a syringe lying on a nearby table. Morris instructed her not to look and used the super glue to seal the injection sites. Brown was later admitted to the hospital and required multiple surgeries for abscesses, and later contracted a staph infection. Morris was charged with a felony but was released on bond. There’s been no word on if she is still practicing in the Miami area. And in my home state of Oklahoma, a man lost his nose after his surgeon cut it off during a procedure. Vishal Thakkar went back for eight nose surgeries in the span of a year after his first left him with disrupted sleep. On his last surgery, the surgeon claimed his nose was infected and a decision had to be made since Thakkar was unconscious. He has since refused to work with Thakkar and has accused him of harassing the staff. But what about those who go abroad for lipo or implants? I’ve discussed in the Latin American installment how shady it can be, but European destinations have risks as well. UK citizen Jo Tooley thought she was receiving certified implants during her surgery in Belgium, but she was really given implants filled with an untested type of silicone gel typically used in mattresses. They ruptured, and she paid £5,000 to have them removed. And Dawn Cracknell (also from the UK) was left with a gaping hole in her side after a surgery in Prague. She suffered from internal bleeding after her tummy tuck, and has since undergone three corrective operations. Bottom line? Cosmetic surgery isn’t pretty. It’s real, it’s scary, and it carries serious risks that can become life threatening. So if you’re considering going through with liposuction or breast implants, make sure you do your research. And ditch the coupons.